Towards a Spiritual Psychology is a collection of papers by eminent psychologists and philosophers living and teaching in such faraway countries as USA, Japan and India. What is spiritual psychology? In the Indian tradition this is asserted as atmanam viddhi. The duty is to know the self. Spiritual psychology is the discipline that studies the ways of knowing and realizing the self. By postulating the primacy of the spirit/self, the principle or center of consciousness, spiritual psychology explores mind as the interface between the spirit and the body in the person. In so doing, it builds disciplinary and conceptual bridges between science and spirituality, the subjective and the objective, the personal and the transpersonal, and the cognitive and the transcognitive in the human condition. 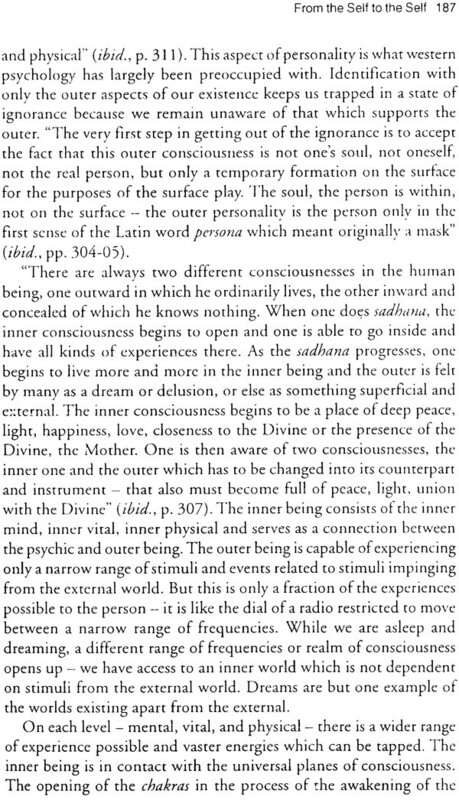 Inasmuch as it asserts the primacy of the spirit as the center of consciousness and its non-reducibility to material forms and advocates "inner" focus, turning inward, as a necessary means to understand human nature and for transforming human condition, Indian psychology may be considered as the "mother" of spiritual psychology. It is not the prediction and control of behavior that is the objective, but the liberation of the person from existential constraints. Spiritual psychology seeks more than mere adjustment. Rather it aspires for total transformation of the person to achieve higher levels of awareness and excellence. K. Ramakrishna Rao, Ph. D., D.Litt., is currently President of the Institute for Human Science and Service, Visakhapatnam, India. His previous academic appointments include Professor of Psychology and Vice-Chancellor at Andhra University, Visakhapatnam, and the Executive Director of the Foundation for Research on the Nature of Man, Durham, NC, USA. Rao also served as Advisor on Higher Education and Vice-Chairman of the State Planning Board in the government of Andhra Pradesh. An acknowledged international authority on Indian psychology, consciousness studies and psychical research, Rao was elected twice as the President of the Indian Academy of Applied Psychology and served three times as the President of the US-based Parapsychological Association. He edited the Journal of Indian Psychology and the Journal of Parapsychology. His publications include about 200 research papers and 12 books. His most recent book is Consciousness Studies: Cross-cultural Perspectives (McFarland, 2002). Sonali Bhatt Marwaha, Ph.D., acquired her training in Clinical Psychology from S.N.D.T. Women's University, Bombay. After an M.A. and M. Phil. In clinical psychology, with a focus in neuropsychology, a quest to explore the self led her to undertake a theoretical analysis of Belief Systems, Self, and Emotions, for her Ph.D. thesis, which was awarded by the Andhra University. This interest is guiding her future work. Her areas of interest are in the interface between philosophy, religion, and psychology, and in the study of religio-cultural aspects of self and identity. Her forthcoming book, Colors of Truth: Religion, Self, and Emotions, explores this interface. She is currently Director, Center for Empowerment of Women at the Institute for Human Science and Service, Visakhapatnam, India. This volume includes papers presented and discussed at two conferences held in Visakhapatnam under the auspices of the Institute for Human Science and Service (IHSS). The IHSS is an innovative institution, designed to be an experiment in Gandhian education. It endeavor to advance learning and to help improve human condition through service by linking classrooms with centers of community service. The IHSS is promoted by a nonpolitical think tank of intellectuals, social activists, service oriented professionals, and academic leaders. 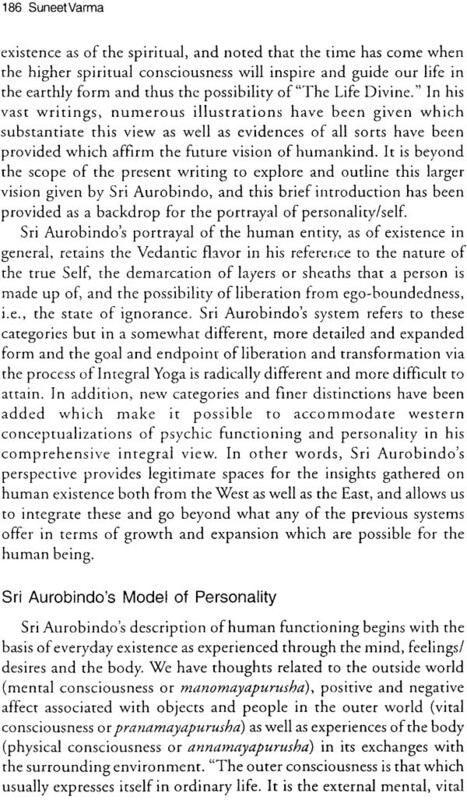 The first conference "Self and Personality in Yoga and Indian Psychology" was held on 9 and 10 December 2003. The second on "Spirituality, Human Health and Wellness" took place on 27 January 2004. The conferences attracted scholars from institutions as far away as Boston and the University of Hawaii in USA, Simon Frazer University, Canada, and the Institute of Religious Psychology, Japan as well as leaders in Indian psychology from several universities in India. In organizing the first conference, we were helped by the Indian Council of Philosophical Research, the Indian Council of social Science Research, Institute for Yoga and Consciousness, Andhra University, and the Infinity Foundation. We acknowledge our thanks to these organizations and especially to Dr. D.P. Chattopadhyaya, an outstanding scholar, philosopher and patron of higher learning, Dr. Kireet Joshi, Chairman of the Indian Council of Philosophical Research and Dr. Rajiv Malhotra of the Infinity Foundation for their interest, support and continued encouragement. For the second conference, we acknowledge the support of the Metanexus Institute under the Local Societies Initiative project. Classical Indian thought is rich in psychological content that is relevant to current psychological concerns around the world. 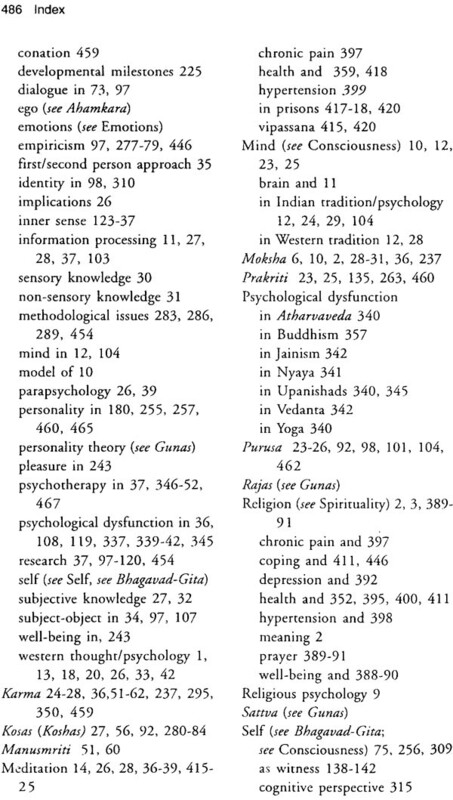 Even though a majority of papers included in this volume deal with issues relating to self and personality from the Indian perspective, they provide a useful background for the emergence of a new discipline, which may be appropriately called spiritual psychology. Spiritual psychology is different from religious psychology. It involves study of the mind as the interfacing instrumentality between consciousness and the brain. 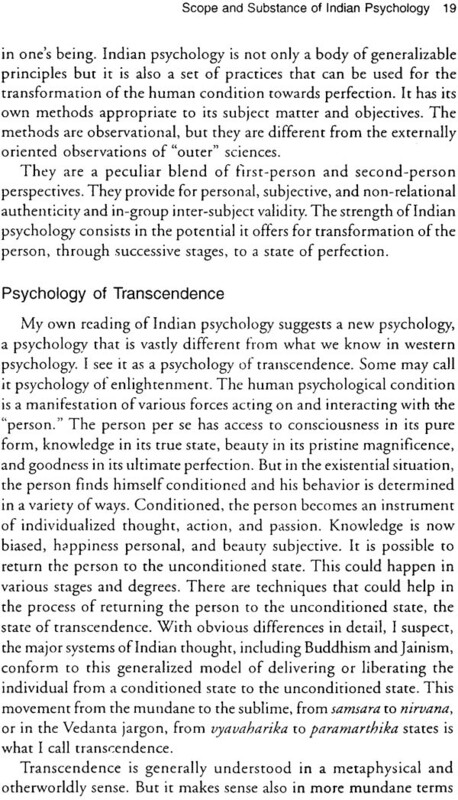 Indian psychology, inasmuch as it (a) is the study of the person, embodied consciousness, (b) has the "inner" focus and (c) aims at transformation of the person rather than manipulation of behavior from outside, it may be considered the "mother" of spiritual psychology. 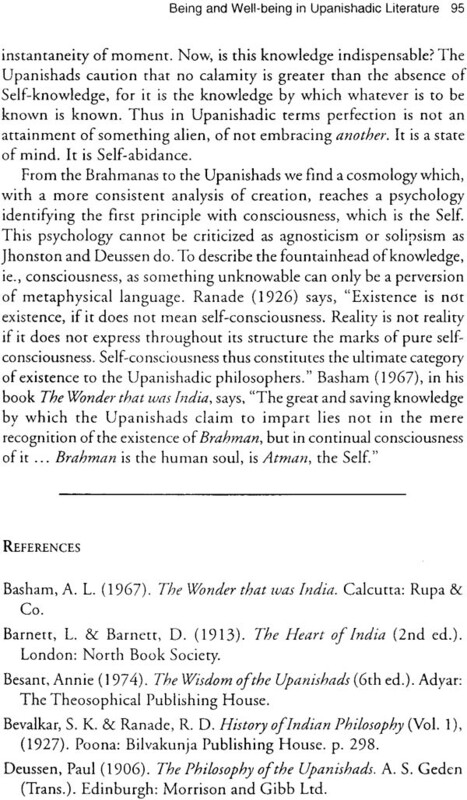 In the Indian tradition, consciousness is considered the center of being. It is the self of the person. It is irreducible to material forms. It is non-relational and is "cognitively closed" Because it is not an object of cognition. However, it can be realized in an altered state of the mind. 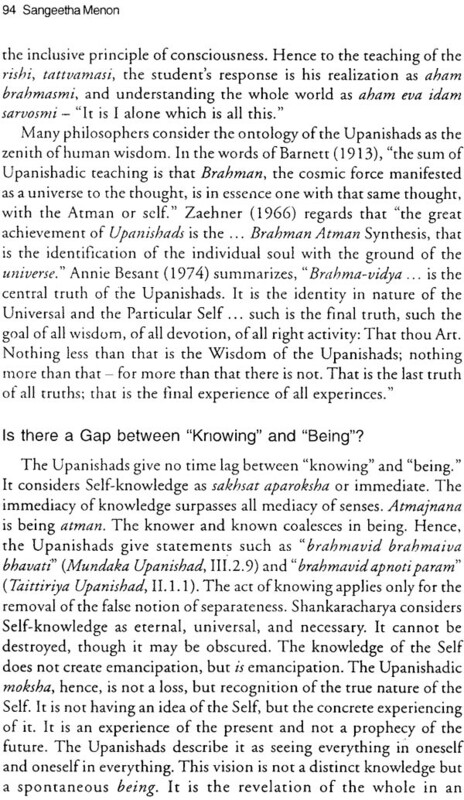 A corollary to this is epistemic dualism, the recognition that there are two basic sources of knowledge  knowing by sensing and knowing by being. We recognize that editing a volume like this is not easy. The major challenge is getting the right people and their cooperation. In this, I believe, we succeeded to an appreciable degree. Another difficult challenge, which I am afraid we did not succeed to the desired extent, is maintaining the uniformity of style through out the volume. The text contains a lot of Sanskrit words. They were spelled differently by different authors. Even diacritical marks did not help. Since the same word means different things in different contexts, our difficulties multiplied. Therefore, we have reluctantly come to the decision to leave the transliteration of Sanskrit words in the way the authors have written. We only endeavored to maintain uniformity in each chapter. We hope that this modest volume, a combined effort of many scholars, would stimulate interest in spiritual psychology. Our greatest indebtedness is to the authors who ungrudgingly gave their time and cooperated with us through out. There are many people who helped us in producing this volume. First is the help I received from all my colleagues at the Institute for Human Science and Service and Prof. P.V. Krishna Rao. Among those who gave their full support and time from outside, I gratefully acknowledge my indebtedness to Prof. Anand Paranjpe, Dr. Matthijs Cornelissen, Prof. Janak Pandy, Prof. Girishwar Misra, Prof. Dharm Bhawuk and Dr. Sangeetha Menon. Lastly, my appreciation and thanks go to Dr. Makarand Paranjape for his interest in publishing and promoting this volume and to Dr. Chandana Dutta for her help in producing it. It has been both a privilege and a pleasure for me to have inaugurated the Seminar on Self and Personality in Yoga and Indian Psychology, organized by the Institute for Human Science and Service and the Institute for Yoga and Consciousness of the Andhra University. Psychology in India has a long past and short history. While us past belongs to the hoary Indian philosophic-religious tradition, its history belongs to the academic endeavors. Therefore, let us reckon Indian psychology in the context of the historical development of psychology in general. The face of psychology has undergone a number of changes in the last century. In the process of becoming an objective science modeled after the natural sciences psychology severed its umbilical cord with philosophy and has grown under the aegis of biology. Its subject-matter and method varied from time. In the beginning, the emphasis was on the study of conscious experience with the methods of introspection. But soon, under the influence of behaviorism, psychology came to be defined as the science of behavior, without much provision for the study of subjective processes. Behaviorism, which has come to be identified as the first force in psychology, subscribed not only to methodological behaviorism but also to a radical position, which by implication at least, denied consciousness. The emphasis was on objective data and learning theory. The British philosopher-psychologist, Cyril Burt (1962) satirized the state of affairs in psychology in the early 1960s thus: "Psychology having first bargained away its soul and then gone out of its mind, seems now, as it faces an untimely end, to have lost all consciousness." More or less simultaneous with the first force in psychology, psychoanalysis, which viewed man as a grasping creature dominated by unconscious motivation and conflicts, has been identified as a second force. Both the behaviorists and Freudians emphasized the continuity of man with the animal world and tended to ignore his uniqueness. As a challenge and reaction to these two orientations, humanistic psychology emerged as the third force in psychology (Goble, 1970; Sutch & Vich, 1969). Humanistic psychology has been concerned with the uniqueness of man, his potentialities, subjective experiences and values. The humanistic movement within psychology further led to the emergence of a fourth force in psychology, known as transpersonal psychology (Tart, 1975). It deals with the ultimate human capacities and potentialities, spirituality, transpersonal, and transcendental experiences. Transpersonal psychology represents a synthesis of Western science and Eastern philosophy and psychology. This expansion in the direction of regaining a lost perspective in psychology has begun and it is in this context that classical Indian psychology appears to be highly significant to modern psychology. 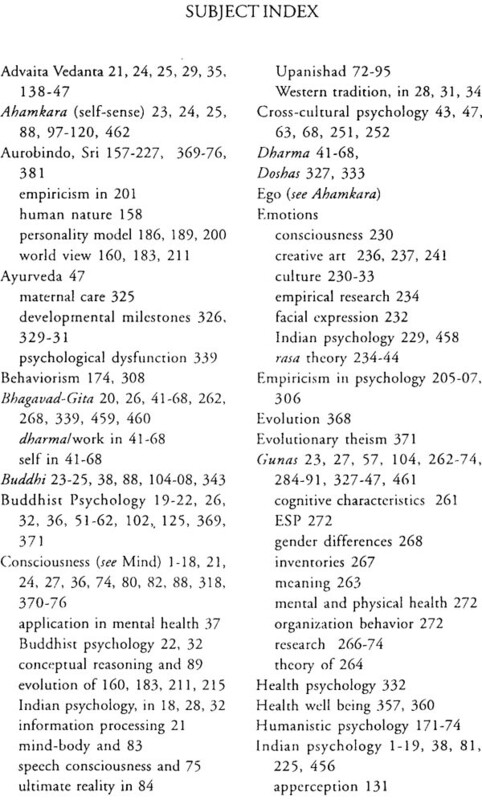 Robert Ornstein (1973), an expert in the area of consciousness studies, among others, pointed out the need for re-establishing the basis of psychology by linking current studies on states of consciousness with "esoteric" psychologies such as yoga and Buddhism. Notwithstanding the divergences in the details of various philosophical systems, the classical approach to the study of man is essentially the same. Self, or consciousness, is the distinguishing principle. The subject-object distinction is superfluous. Introspection or meditation is the method par excellence. The chief aim is to unveil and integrate into consciousness what is hidden from the senses. Hindu and Buddhistic scriptures present a comprehensive account of the workings of the human psyche and ways in which one can control and develop oneself in order to live a happy life and be emancipated from the cycles of life  a belief common to all the philosophical systems. The ultimate goal of all self-discipline yoga, tantra, and meditation is a blissful union with the Supreme Consciousness or the Self in its transcendental dimension of oneness with the whole being. 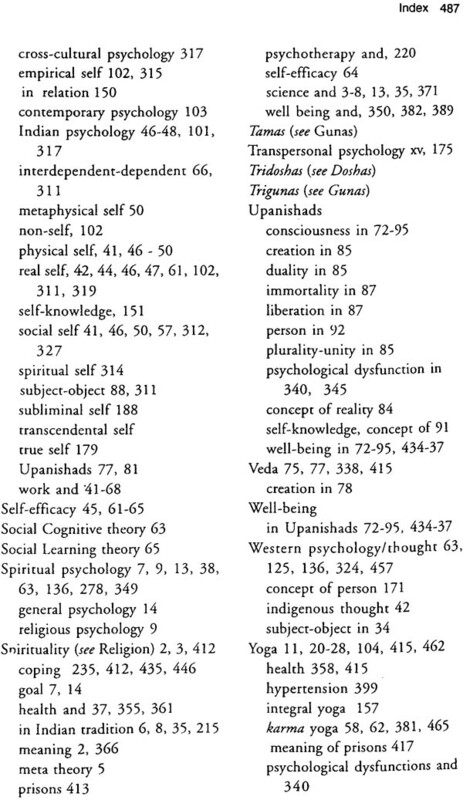 "Indian psychology," stated Swamy Akhilananda (1952) "is not merely conceptual or theoretical. Its therapeutic value is in its teaching of various methods of mental integration. It prescribes systems of physical and mental discipline which gradually stabilizes the mind and integrates the emotions." Durgananda Sinha observed that "in Indian Tradition, the ultimate aim of knowledge is not to gain material benefits through power over nature, but it is for one's own self-realization and self fulfillment. 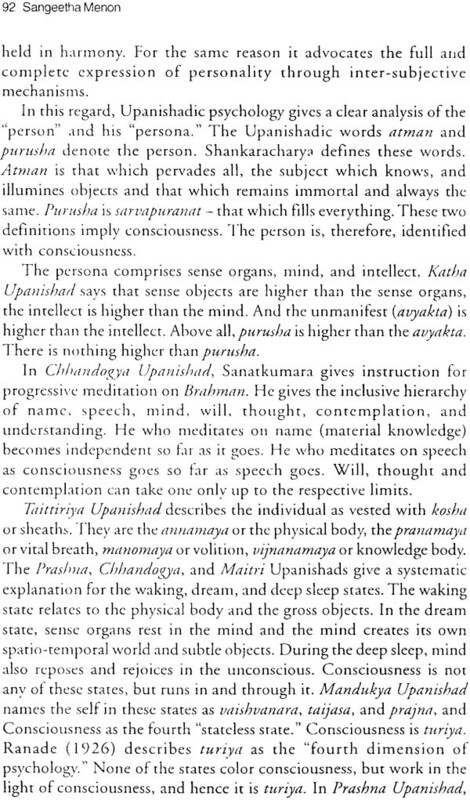 The Sanskrit expression 'Knowledge for the purpose of liberation (savidya ye vimuktaya)' represents the guiding objective of Indian psychology which contrasts with the Western orientation. Therefore, Indian psychology provides for controlling body and mind. Relaxation, meditation techniques of self-control, the ultimate aim being the highest well-being of man." Prof. K. Ramakrishna Rao, my revered friend, philosopher, and guide described Indian psychology as the psychology of transcendence and stated that "transcendence is generally understood in a metaphysical and otherworldly sense. But it makes sense also in more mundane terms by signifying an effort to transform the individual to reach the desired goal of knowing truth, becoming objective, and partaking in the good and the beautiful that are veiled by conditioned biases and distortions brought about by attachments and subjective contortions in one's life history" (Rao, 1988). Thus, Indian psychology is a practical psychology and not merely theoretical or metaphysical. contains the clue needed by the West if the analytic method and theory is to reach its fullest scope as a regenerating and recreating factor in modern life." Allan Watts (1961) discussed the similarities between Western psychotherapy and Eastern ways of liberation and noted that "the main resemblance between these Eastern ways of life and Western psychotherapy is in the concern of both with bringing about changes of consciousness, changes in our ways of feeling of our own existence and our relation to human society." 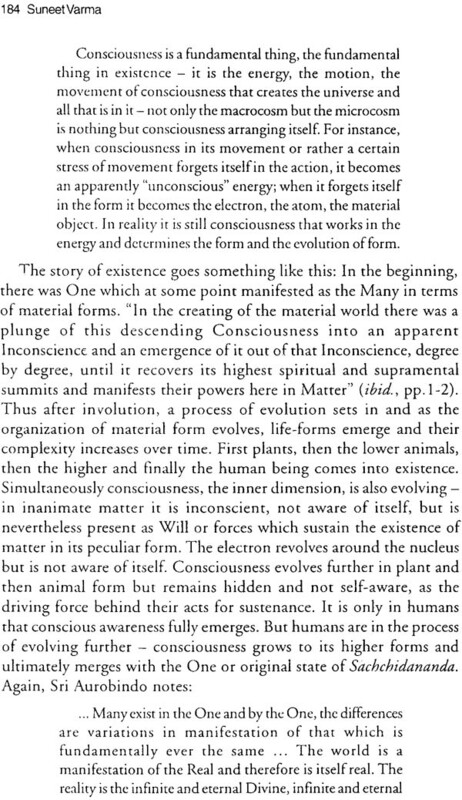 Fingarette (1963) showed analogies in the viewpoints on the transformation of an individual in psychoanalysis and transformation of self in the process of enlightenment. He remarked that "there is a conceptual bridge which will lead us from West to East, but the bridge is erected not with the concepts of physics and history but with the concepts of psychology." 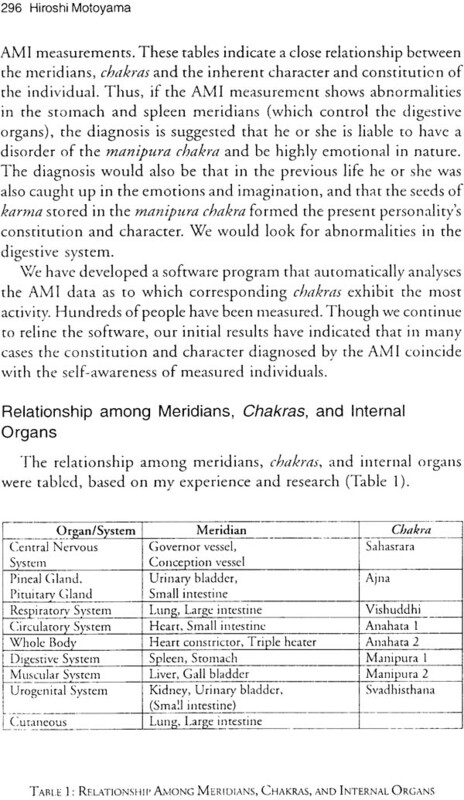 On the basis of empirical studies on spontaneous and induced altered states of consciousness, Charles Tart (1972) laid down theoretical foundations for creating, what he calls, state-specific sciences. According to Tart, our normal consciousness is a discrete state of consciousness, which is stabilized by a set of psychic structures that function to regulate our awareness in a specific way. This is reasonably stable for an individual and is normally shared by others. However, when this set is modified or altered, the individual enters into an altered state of consciousness and may experience something different from the ordinary. Experiences, such as ecstasy, mystical union, rapture, space-time transcendence, are not adequately dealt within conventional scientific approaches or "swept into the wastebasket category of 'subjective' and 'pathological' experiences." Instead, Tart suggests that we may create state-specific sciences, sciences particular to discrete altered states of consciousness having croups of highly skilled, trained, and dedicated practitioners able to achieve certain states, who agree with one another on their common attainment of the state, and then investigate further areas of interest such as the interaction of that state with ordinary physical reality, the interaction of people in that state, etc. 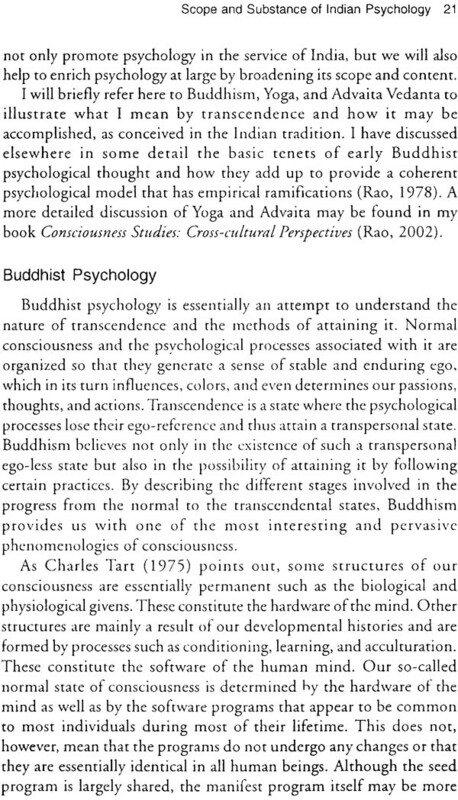 Tart seems to suggest that spiritual psychologies may contribute to the development of such sciences, and that the spiritual methods such as meditation may be considered as the state-specific technologies. 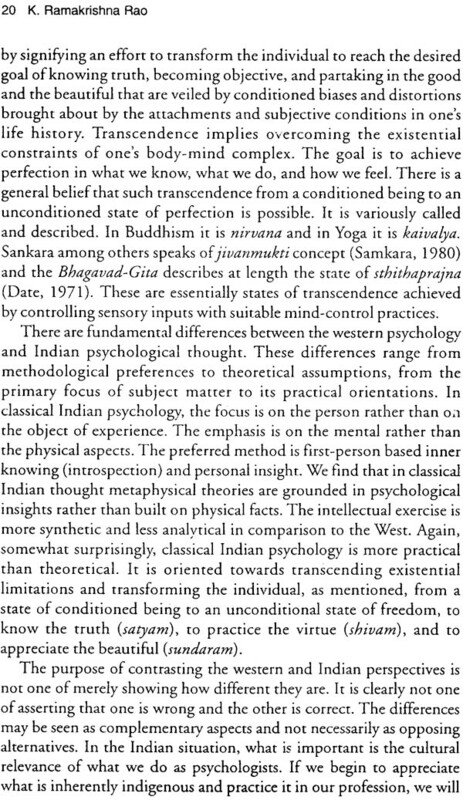 From this perspective, Hindu and Buddhist psychologies provide methods as well as theories for the development of state-specific sciences and technologies. 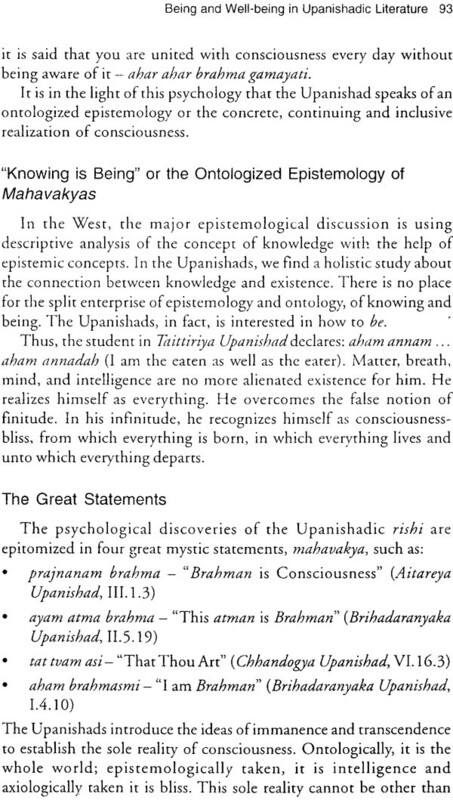 As the Indian philosophical systems are much concerned with private subjective experience than external objectivity, this kind of an approach to spiritual experiences may help to achieve a degree of "public observation," systematization, and verification. After all, science deals with knowledge and all knowledge is experiential. The relevance of Samkhya Yoga, Advaita, and Buddhism to this approach is obvious. A strong case for such an endeavor has already been made by a number of psychologists, such as Anand Paranjpe (1984) and K. Ramakrishna Rao (1978, 2002). 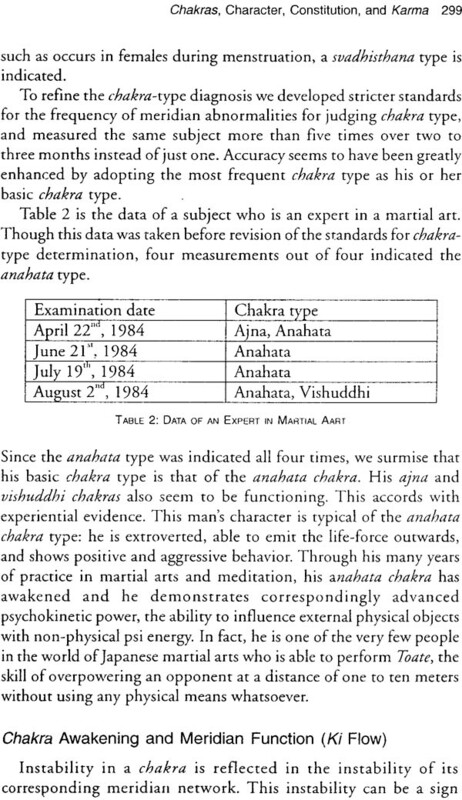 Empirical research, since the early 1930s, on yoga and meditative practices (Behanan, 1937; Brosse, 1946; Bagchi & Wenger, 1957; Rao, 2002; Wallace, 1970; Walsh, 1979) steadily indicated remarkable changes in psychological processes, enhancement of certain skills, and personality changes among practitioners. Meditative methods, such as transcendental meditation, vipassana, and yoga have come to be used as adjuncts to psychotherapy by a number of psychologists and psychiatrists (Goleman, 1975; Engler, 1984; Orme-Johnson & Farrow, 1977; Vahia, 1973) in India and abroad. Significant attempts have also been made by Swamy Rama and his colleagues, Ajaya and Ballantine (Rama, Ballantine, & Ajaya, 1976; Ajaya, 1983) among others, to develop a full-fledged psychotherapeutic system based on yoga, and to put it into practice. Abraham Maslow (1968), who gave an impetus to the humanistic movement in psychology, arrived at two important concepts on the basis of his investigations of healthy people. 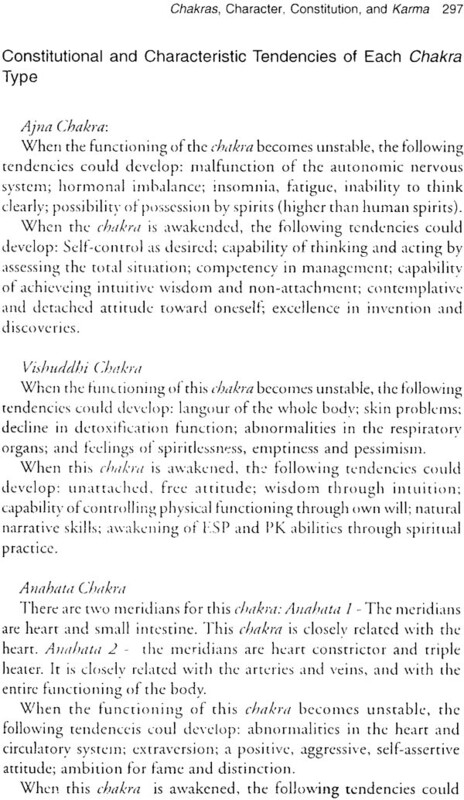 These concepts that comprise self-actualization and peak experiences, are comparable to self-realization and mystic experiences of classical Indian psychology. According to Maslow, self-actualizing people are those who strive toward maximum realization of their potentials and for a fulfillment and harmony. He described that many people experience transient moments of self-actualization, and named such experiences as peak experiences. A peak experience is characterized by happiness and fulfillment; it is a temporary, on-striving non-self-centered state of perfection and goal attainment. Maslow found the peak experiences to have most of the characteristics traditionally ascribed to religious experiences of unity. Further, the field-theoretical viewpoints in psychology that explain the organism environment as a unified pattern of behavior somewhat resembling a field in physics (Murphy, 1945); the quantum physical theories that seem to suggest the inseparability of the observer and the subatomic energy particles (Capra, 1975); and the holographic models of brain function and consciousness (Pribram, 1978), may be considered to be in line with the experience of unity in the mystical states of consciousness. Thus, Indian psychology, with its insights into human nature, seems to be capable of supplementing and enhancing the methodology and conceptual framework of modern psychological inquiry. Though a number of publications (Kuppuswamy, 1985; Ramachandra Rao, 1962; Sinha, 1958) have appeared on Indian psychology, it is yet to be pursued in right earnest in the university departments of psychology for a much-needed breakthrough in psychology in India. I trust that the trident effort in the guidance of Prof. K. Ramakrishna Rao, viz., (i) the Indian Psychology Book Project that was initiated a couple of days ago; (ii) the present seminar/conference on Self and Personality in Yoga and Indian Psychology; and (iii) the refresher course in Indian psychology to follow this seminar, will be a turning point in the history of psychology in India. Academic psychology that began in India with the establishment of the first department of psychology at Calcutta University in 1915 remained, for a very long time, imitative and replicative of Western psychology. A growing dissatisfaction with this state of affairs has led to a gradual increase in problem oriented and culture sensitive research on the one hand, and indigenous approaches on the other. As we have glanced at, inn the Western front, too, there has been a considerable interest in non-Western/Eastern perspectives of psychology. Hence, there is a strong need for concerted efforts to systematize and promote Indian psychology through writing, research, teaching, and application. I am very glad that the Institute for Human Science and Service, and the Andhra University's Department of Psychology and Parapsychology, and the Institute for Yoga and Consciousness, all of them founded by Prof. K. Ramakrishna Rao, are among the front runners in this endeavor, which may rightly called a yajna. I extend my thanks to the Institute for Human Science and Service and the Andhra University for according me this unique opportunity, and my best wishes for successful deliberations and outcome of this seminar, in which a number of leading psychologists of this country and a few from abroad participated. In the Indian tradition, psychology is considered in its broadest perspective. Even though the concern is with the individual person and his liberation from the existential constraints of ignorance and suffering, no sharp distinction is made between individual and society, subject and object, and so on. It is holistic in its synthetic best sense. Its meta-theoretical postulates help to overcome dichotomies and distinctions, such as sacred and secular, spirituality and science, which create artificial divides and disjunctions that leave a glaring gap between the two, such as between body and mind in Cartesian dualism. 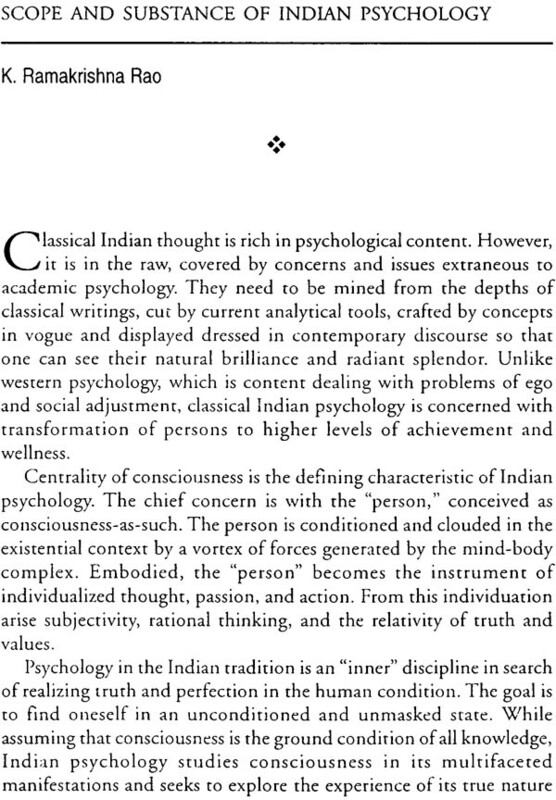 In a sense, Indian psychology provides a new paradigm that appears to be more appropriate for investigating some of the difficult and challenging areas that the currently dominant paradigm in psychology is unable to effectively address. These include conflict resolution at the social level, epidemiological studies connecting religious beliefs and practices with better health outcomes, extraordinary human experiences, and the transformational possibilities of psychological science for developing human potential and wellness beyond ego adjustment and stress reduction. In the western intellectual tradition, analysis is the main instrument of inquiry. Analysis results in making distinctions and classifications. So we have at a very fundamental level dichotomies such as subject and object, natural and supernatural. In the Indian tradition, however, the focus on dichotomies is less sharp as the endeavor is to find a unifying higher order. The science and spirituality dichotomy is in large part a western legacy. Hence the typical attempts to reconcile the claims of the two have a western orientation. The western approach at reconciliation has tended increasingly in the direction of either ignoring/denying the subjective and the supernatural or reducing them to objective and natural phenomena. In the process we are haunted by what may be called the "paradox of naturalizing the supernatural." In the eastern tradition with its own synthetic stance, there is less of such a dichotomy and a greater scope for finding each its niche. Spirituality and religion have gained a measure of respectability in recent years in academic discussions, thanks to the substantial literature that appears to connect them to health (George et al. 2002; Koenig et al., 2001). 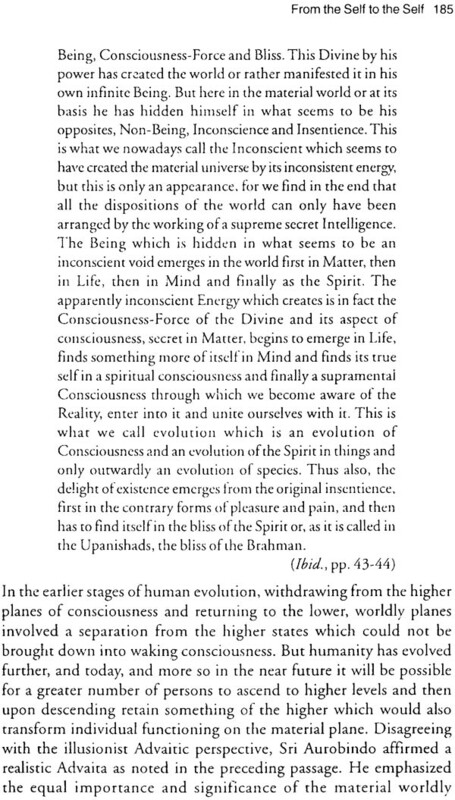 However, what the concepts spirituality and religion precisely mean is a matter of considerable controversy. For example, Koenig et al. (200 1) in their Handbook of Religion and Health call our attention to the difficulties involved in finding acceptable definitions for religion and spirituality. Pointing out the inadequacy of their dictionary definitions, they list several distinguishing characteristics of religion and spirituality (Table 1.1, p. 18). These include, first, religion is community focused, observable, measurable, and objective, whereas spirituality is individualistic, less visible and measurable and more subjective. Second, religion is organized, behavior oriented, and involves outward practices. Spirituality, however, is less formal and systematic and more inward directed. Characterizing religion as "an organized system of beliefs, practices, rituals, and symbols," Koenig et al. (2001) regard spirituality as "the personal quest for understanding answers to ultimate questions about life, about meaning, and about relationship to the sacred or transcendent ... " (p. 18). They depict spirituality as the outer circle which includes various religions as inner circles (see Fig. 1.1, p. 19). Others like Teresa Woods and Gail Ironson (1999) also emphasize the public and private aspects of religion and spirituality. However, it is well known that William James (1902) among others emphasized the private aspects of religion as well. It is suggested, therefore, that religion and spirituality are overlapping constructs. They exhibit some common characteristics and some nonshared features (Miller & Thoresen, 2003). According to Miller and Thoresen (2003), "the field of religion is to spirituality as the field of medicine is to health" (p, 28). This view suggests that spirituality is an inner circle within the wider circle of religions, a view somewhat different from the one expressed by Koenig et al. (200l ). Empirical studies of spirituality and religion have rarely made operational distinctions between the two. Again, to quote Miller and Thoresen (2003), "almost all empirical studies to date have not recognized the distinctions ... but instead have treated religiousness, religion, and spirituality as the same general concept" (p. 29). Further, they point out that "with rare exceptions, the available literature has measured religious ... rather than spiritual variables" (ibid). The latter assertion may be an oversimplification, once we acknowledge that spirituality and religion are not sufficiently well distinguished 'for operational purposes. Peter Hill and Kenneth Pargament (2003) point to the dangers of bifurcating religion and spirituality. They list four such dangers: (i) manifestation of spirituality in all its forms occurs in a social context and all organized religions address personal affairs. Therefore, the view that one addresses issues at the social and the other at the personal level is untenable; (ii) there is a growing tendency to think that spirituality is good and religion is bad. There is no justification for such attributions as both have potentially beneficial as well as harmful sides; (iii) for most people, the distinction between religion and spirituality does not exist. They have spiritual experiences in an organized religious context; (iv) the polarization of the two concepts, spirituality and religion, "may lead to needless duplication in concepts and measures" (p. 65). Hill and Pargament suggest that the sacred, which includes the divine and the transcendent, is "the common denominator of religious and spiritual life" and spirituality is "a search for the sacred, a process through which people seek to discover, hold on to, and, when necessary, transform whatever they hold sacred in their lives" (ibid). The definitional and operational ambiguities of religion and spirituality constructs spill over into the science-religion dialogue. Without a certain degree of clarity of the core concepts, religion and spirituality, the science-religion dialogue would be a nonstarter. We believe the spiritual traditions of the East have something to offer in this context. There is a general consensus between the eastern and the western perspectives that the common ground between religion and spirituality is the sacred. The sacred may refer to different things such as god, divinity, ultimate reality, and so on. The common denominator for all of them, it would seem, is transcendence. Transcendence implies going beyond what is given in one's normal sensory experience. In the spiritual traditions of India, whether Hindu or Buddhist, there is an overwhelming emphasis on transcendence as a state of being that goes well beyond sensory awareness. Spiritual pursuit is an exercise for the transformation of the human condition to achieve transcendence. Spiritual psychology is dedicated to understanding this process. Thus in the Indic traditions, spirituality is the quest and religions are the tools and technologies, first, to aid in that quest and, second, to apply the discoveries of the spiritual quest to life and living. Spirituality is to religion what science is to technology. Seen in this light, science and spirituality are two truth seeking activities that seem to run parallel to each other.